A Swedish hair product advertisement in the Stockholm subway makes a model's hair blow. There’s nothing like feeling your hair blow in the wind, but the wind from an approaching train doesn’t exactly create a glamorous breeze. Unless you’re in the Stockholm Metro. 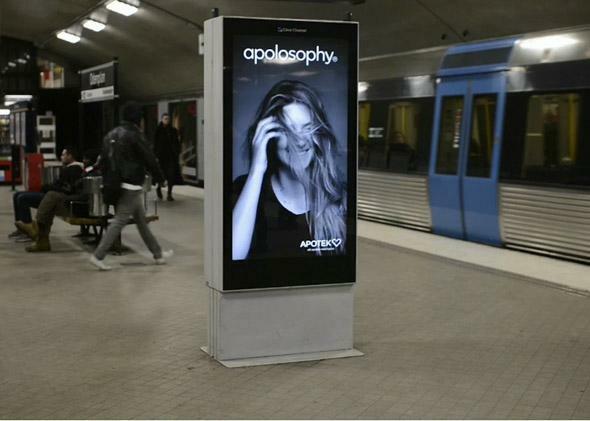 For its new line of hair products, personal care brand Apotek created a subway ad that moves a model’s hair when trains enter the station. The normal-looking display screen has ultra sonic sensors inside that feel trains arriving and whip the model’s hair arround in the correct direction for the train’s breeze. At the end the model smiles and rakes her hair back into place. If only it was so easy to tame your mane after a rough morning commute.